Merry Christmas from The Michael Collins Foundation! The December 2016 Newsletter is now available by clicking the picture/link below. 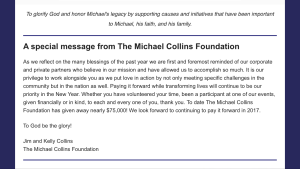 Read a special message from Jim and Kelly Collins, learn about MADD’s new Michael Collins Humanity Award, find out the date of the 2017 MCstrong 5K Classic, and much more!